My wife likes to call New Years Eve, Amateur Night, because she works downtown Minneapolis every day. It's perhaps acceptable to surrender the city on this night—of all nights—to people who might not otherwise be as familiar with one-way streets and tall buildings. Combine celebratory drinking with a crowd not used to driving downtown along icy streets at night and you are bound to create a few problems. Similar issues can arise when you host a party, whether it's Amateur Night or otherwise. One way to avoid a problem is to offer your guests a selection of alcohol-free cocktails. I'm not talking about water (which you should have anyway), soft drinks and juice. 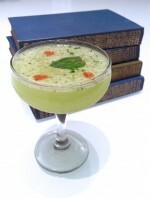 I am talking about actual alcohol-free cocktails that are every bit as fun to make and as tasty to consume as their judgement-impairing counterparts.